In the last Rainmaking Recommendation, I discussed the idea of Enlightened Rainmaking™. As I explained, this is using tactics or techniques to educate or “enlighten” your prospective clients, referral sources and clients about what you do in a way that allows them to come to you. Enlightened Rainmaking begins with creating content and information laden blogs and videos, white papers and information packed website, and social media posts which addresses your prospective clients’ and clients’ needs and questions. You need to find a way to attract your ideal clients to your work. The laws were less complicated. In 2016, according to the American Bar Association’s National Lawyer Population Survey, there are 1,316,561 lawyers in the United States and 175,195 lawyers in New York State alone! Competition is fierce; the laws are so much more complicated than they used to be. If you do not have a niche or ideal client, please consider this as the first step to becoming an Enlightened Rainmaker™ and choose an audience to whom you want to “speak”. The second step is creating content. But, it’s not just about creating content for the sake of creating and posting information. 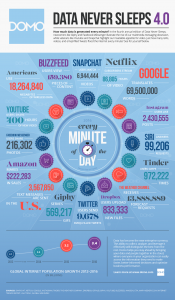 There is so much content created and downloaded every day. 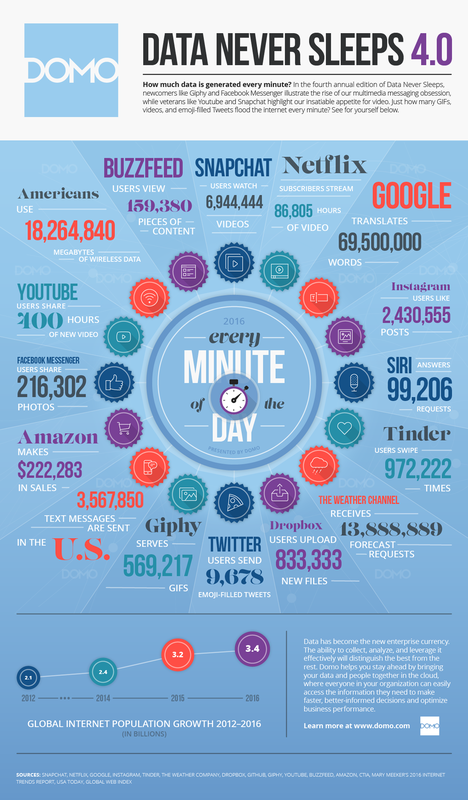 The infographic from Domo (above – click to enlarge) shows the astounding amount of data consumed and generated every MINUTE of every day. And, because of the number of lawyers out there who are doing exactly what you do (just google your practice area to see) you have to find a way to stand out. You have to find a way to create content that speaks directly to your ideal client audiences and their strategic referral partners. You have to be intelligent and use their language. You have to be interesting and authentic. Stop using legalese. This means finding out what your ideal client is seeking on search engines and using those words strategically in your content. And in the next blog, I will be discussing how to find and use these words – also known as “Keywords” – in a strategic manner to get found.